Less aggressive compound. Step No. 1 in the Finesse-It 3000 process as indicared on the label (the process includes Step #1, 3M's 06085, Compound for most paints; step #2, 06064, Swirl Mark Remover; & 06068, Ultrafina SE [Swirl Eliminator] for dark colors or difficult swirl marks); step #3. 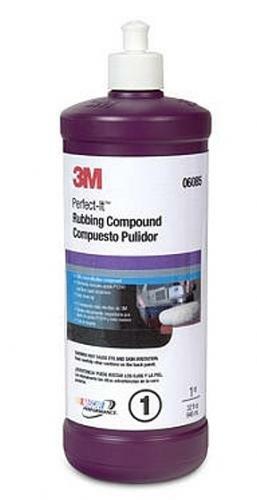 Designed to remove 1500 grit sanding marks on fresh or cured paints. Leaves ony a fine swirl marked finish. Replaces the discontinued 6062. Use with a wool pad and follow with Step No. 2, Perfect-It 3000 Swirl Mark Remover 06064 on a foam pad for a flawless finish. For dark colored cars with stubborn swirl marks, further finish with step No. 3, Perfect-It 3000 Ultrafina SE (Swirl Eliminator), 6068 on the 3M Ultrafina foam pad, 3M 05751 and enjoy the compliments.